It might look and feel like something from a fairy tale, but parts of the New Forest are only a 20-minute drive from Southampton. If you’re cruising from the city, England’s most visited National Park guarantees a storybook start to your holiday. The New Forest is one of those places that has you reaching for your mobile and logging onto the Rightmove website within minutes of arriving. There’s something about the lifestyle here, all country pubs, local farm shops and wide open spaces shared with wild horses and grazing ponies, that makes a life spent in a thatched cottage in the middle of nowhere sound awfully appealing. 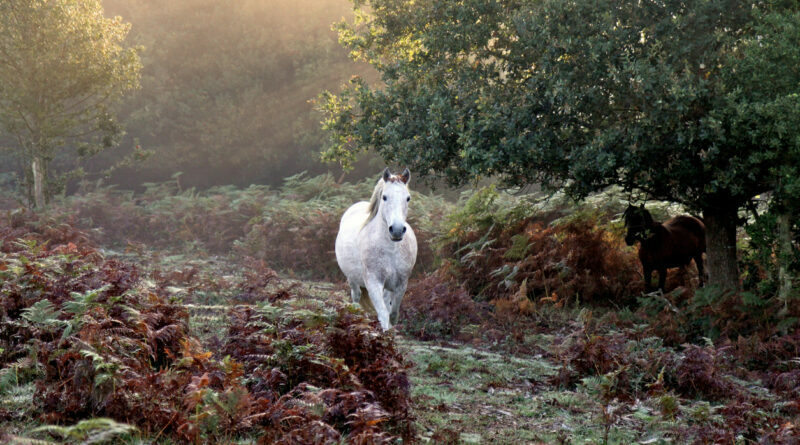 The ancient woods and rolling heathlands that make up the New Forest’s 220 square miles once spread across an even greater area of Southern England, but whilst its extent has diminished, its beauty hasn’t. Bluebells bloom in spring and purple heather appears each autumn. More than 6,000 wild horses and ponies roam free in the forest, the result of a centuries-old law that dates from 1079 and remains in place today. You will happen across the ponies every few minutes, grazing on the gardens of grand Victorian mansion houses and drinking from babbling brooks, entirely undeterred by your presence. The unique appeal of the New Forest is that it remains largely untouched and nowhere more so than on the Northern Commons. The Foxbury, Rockford and Ibsley Commons are steeped in history, various Bronze Age burial grounds and military bunkers breaking up leisurely walks through wild heathland and ancient woodland. Less remote than the commons, but no less charming, is the maritime village of Buckler’s Hard. Sitting on the banks of the Beaulieu River, one of the few privately owned rivers in the world, this historic hamlet has a lengthy naval history. Oak from the surrounding woodland formed the backbone of Royal Navy ships during the shipbuilding yard’s heyday, with fifty built here in the early 1800’s and sent to fight in the Battle of Trafalgar. Visitors can find out more at the Buckler’s Hard Maritime Museum, before strolling a scenic couple of miles along Buckler’s Hard Yacht Harbour to the Beaulieu Estate. This sprawling stately home has built quite the history over its 800 years, having been a private royal hunting lodge of King John, to a Cistercian abbey and finally a family estate, purchased from Henry VIII for the princely sum of £1,340 in 1538. Since the very first opening day of Beaulieu Estate to the public, it has become something of a tradition to display vintage cars in the grounds. Nowadays, this is done on a far larger scale at the National Motor Museum, where the tale of British motoring is told through a collection of 285 classic cars and endless memorabilia. The museum is a must for motor heads, with everything from the World Land Speed Record-breaking Bluebird, to J.S Irving’s Golden Arrow and the ‘is that even roadworthy?’ single-seater Peel P.50 displayed on any given day. 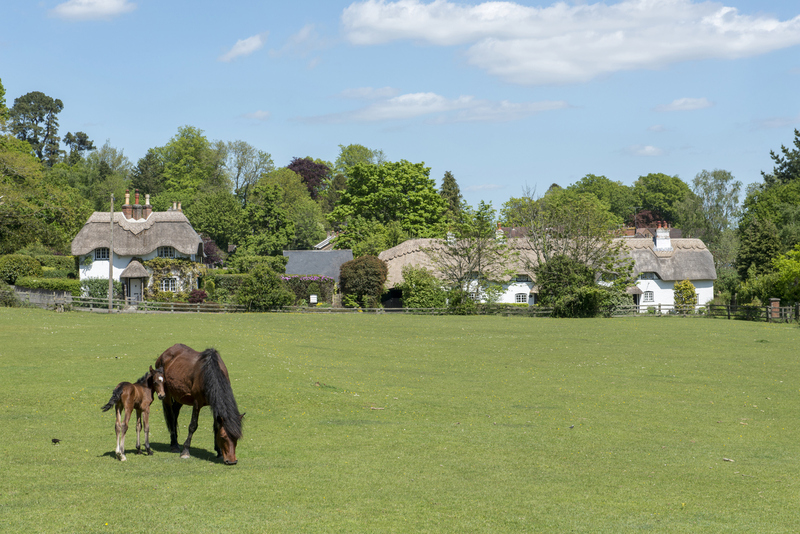 There are countless villages worth a visit in the New Forest, some of them beachy and bustling, others almost silent and home to more animals than humans. If you’re looking for the former, the coastal town of Lymington is quaint British seaside at its best. Elsewhere, Burley is the epitome of a New Forest chocolate box village. It has remained largely untouched over time and days here tend to be spent planning which of the thatched cottages you’d buy with a lottery win, drinking local cider in 16th-century pubs that once hid smugglers and highwaymen, and holding on tight in horse-drawn wagon rides through idyllic glades. After a day in the New Forest, going back to normality sure isn’t easy. Luckily for you, you’re going on holiday in the morning. 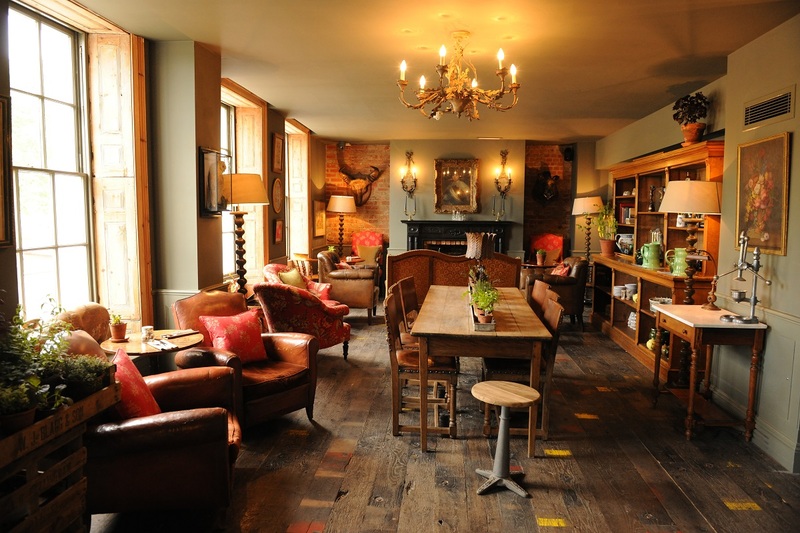 A review of The Pig in the Wall, Southampton’s city centre country house hotel. ‘Fabulous. An oasis in the middle of Southampton’. So said the last message in the guest book at The Pig in the Wall. Within five minutes of checking in, I couldn’t have agreed more. A sunny Sunday in Southampton will be a familiar way to spend a day for anyone who cruises from the city, home to the largest and busiest port in the UK. P&O Cruises’ Ventura was docked when I arrived, loitering until 5.30pm, when the sound of a horn signalled the beginning of its voyage to the clement climes of Spain and Portugal. I’d have given anything to join the lucky so-and-sos headed away for a week in the sun, but looking around at my cosy, calm hideaway in the middle of a lively Southampton, I decided that The Pig in the Wall would do me just fine for now. 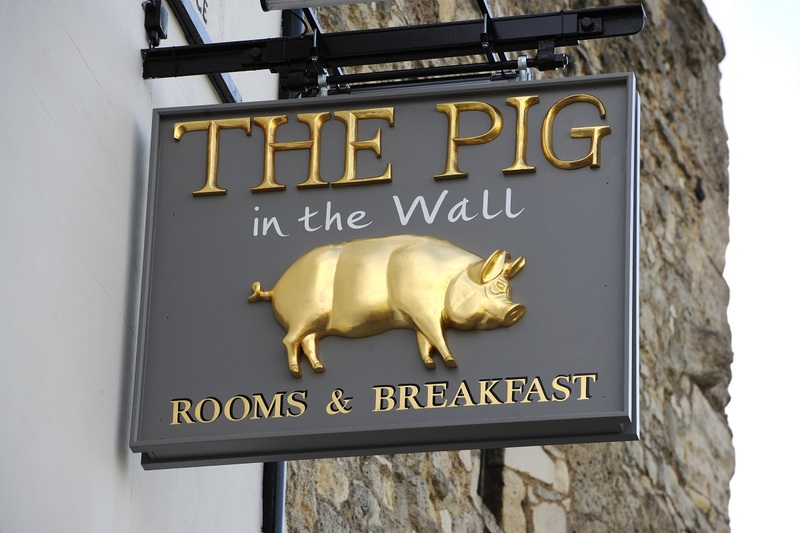 The fact that The Pig in the Wall feels just like a country house hotel, despite its city surroundings, is no coincidence. Every inch of it has been designed to replicate THE PIG in Brockenhurst, the first ever hotel in the still tiny group of five. I have this thing with floors, as the Instagram hashtag goes, and the shabby-chic, mismatched tiles beneath the feet of my room’s giant roll-top bath are the same as those beneath the tables in Brockenhurst’s field-to-fork restaurant. The leather armchairs in each hotel are charmingly well-worn and the cushions on the velvet sofas depict the same country wildlife, all stags and pheasants and farm animals. The walls are the same shade of sage green and there’s a shared appreciation of exposed brickwork. THE PIG in Brockenhurst is a country estate in every sense of the word. The Pig in the Wall is a country estate recreated within Southampton’s medieval ramparts. This compact and bijou boutique hotel sits within the city’s historic walls, just across the road from the cruise terminal and is only a five-minute walk away from the busy West Quay. Investment is high in Southampton right now and West Quay has become a sign of the times, expanded to accommodate almost twenty new restaurants, all recently opened, just in time for summer. Down the road, The Pig in the Wall’s al fresco tables were as full as those outside the restaurant chains of West Quay. 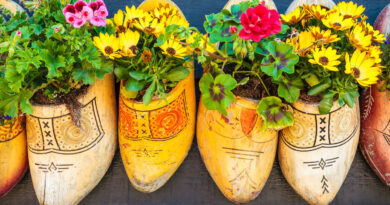 A mixture of visitors and hotel guests tucked into deli snacks and ‘Piggy Bits’, enjoying the first signs of spring at tables set with strawberry plants in terracotta pots. The Pig in the Wall recently introduced a ‘Supper Menu’ too, served between 6-8pm and apparently very popular. However, on this occasion, we were saving ourselves. 6pm rolled around and with it came a Land Rover, silver save for a golden pig on each door, and poised to take us on a private drive deep into the New Forest. Southampton is less than 20 minutes from England’s most visited National Park and only a few more minutes from THE PIG, which is where your private transfer will whisk you for dinner as part of the perfect pre-cruise stay. Having been fortunate enough to experience it, I beg you to do the same. The Pig was foodie heaven and we were only just getting started. We had already crunched into Saddleback Pork Scratchings with a dollop of homemade apple sauce and sampled a ‘sausage roll’ whipped up with vegetables from the restaurant’s Kitchen Garden. THE PIG’s 25-mile menu means that anything which cannot be grown in the walled garden, or in the estate’s vegetable or fruit beds, is sourced within a 25-mile radius. Turn over your menu and you’ll find a map depicting exactly where the various ingredients in your meal came from, down to the nearest half a mile. The fish in our Smoked Cornish Haddock Tart tasted so fresh, it could have swum straight to our plates. 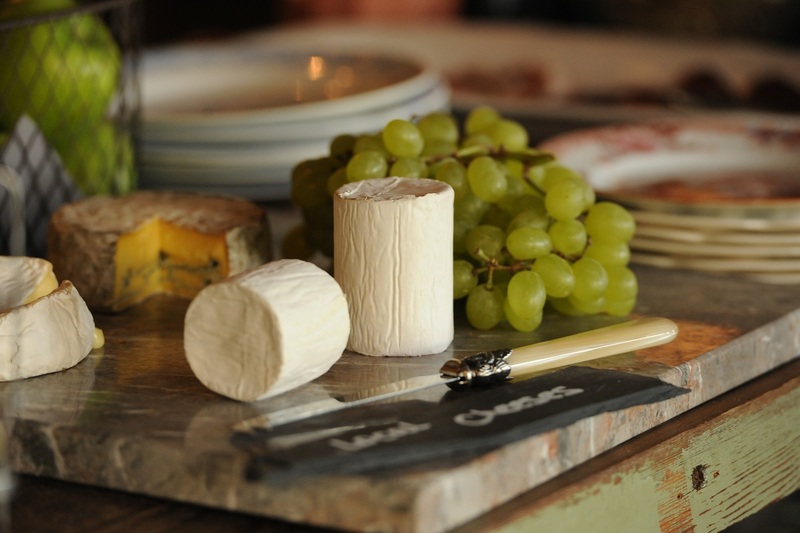 The creamy goats cheese in our Hampshire Lamb Neck & Rocket Salsa Verde main had travelled just 12 miles to make it to the kitchen and the cheeseboard was made up exclusively of Hampshire and Devonshire cheeses, served with an oozy chunk of local honeycomb and pig shaped crackers. The private transfer to dinner is available to all guests staying at The Pig in the Wall, a Land Rover leaving at 6pm for a 9.15pm return, or 8.15pm for a 11.00pm pick-up. 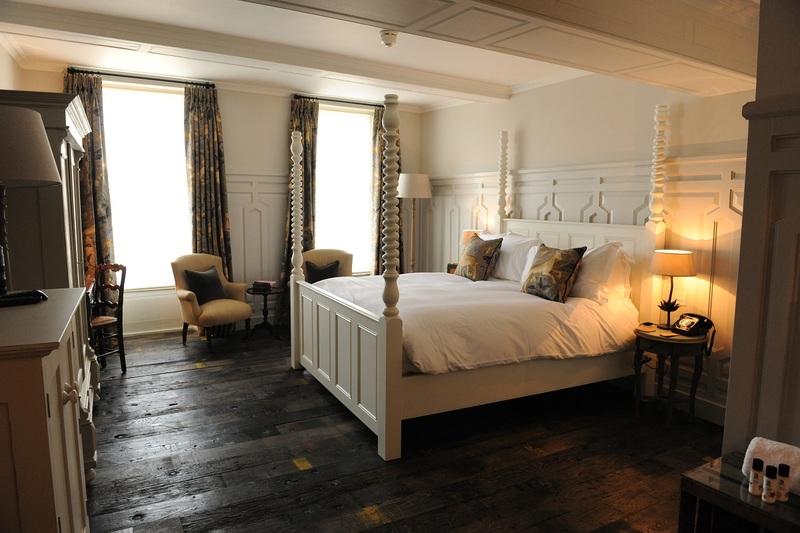 It’s difficult to imagine a better start to your holiday than with dinner at THE PIG and a restful slumber in a four-poster bed at The Pig in the Wall. Being able to stroll across the road and head for the sun the next day is the cherry on top of the cake.